Neapolitan music and cabaret show with dinner!! Let's go back to a special venue where Neapolitan Culture is cultivated in all its aspects! We will begin the evening with a typical Neapolitan gastronomic tasting! 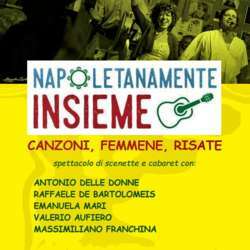 Then the Neapolitan music and cabaret show will follow with a lot of good humor and involvement of the audience! At the end we will taste a typical sweet of the Neapolitan tradition! We will spend an evening in joy and with a lots of music such as "tarantella" in one of the most popular venue to keep faith with the Neapolitan tradition in its essence! I hope to see many of you!! The event will be in Italian and Neapolitan language!! If I don't reach confirmations enough this event may be cancelled. So it's not IMPORTANT to be on list but to CONFIRM ME with private message. Thank you for your comprehension and collaboration!